I can (just) remember when I used to go to the barber’s shop about once a month for a haircut. 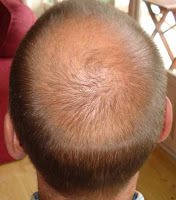 When I developed a sort of personal “ozone hole” on the crown of my head (see photo) I decided for a close-trimmed style and eventually resorted to doing myself with a pair of electric clippers. The lack of hair on my head is compensated for by hair now growing out my ears and nose, perhaps the result of over forty years of gravity acting on my hair follicles. By contrast, shaving ever more infrequently by seemingly always having too much to do, I recently acquired a beard and, as Gabrielle approves, have decided to keep it for the time being. So you can see that hair-grooming paraphernalia won’t be high on my birthday present wish list. However, the same cannot be said of our sheep. Sheep are usually sheared once per year, usually in the spring before the onset of warm weather, making them more comfortable in the warmer months and reducing the likelihood of fly-strike. Our ram, which we bought from Renée, came already sheared and the lamb doesn’t need doing this year, so that just left the ewe. Having neither the equipment nor know-how, Renée kindly offered to come over with her dog-grooming (she runs a kennels and pet care business) clippers and offer advice. The first task is to catch the sheep, not such an easy task in the absence of sheep hurdles with which to herd them into line and so my cunning plan was to rely on the element of surprise. I approached with some of sheep nuts and soon had them eating out of my hand. The ram is more confident and also has a convenient pair of handles (horns) to grab hold of but the ewe is quite flighty and so I needed to make my move both fast and certain as I wasn’t sure of a second go. I pounced and got two good handholds in her thick coat at which moment she took off, dragging me flat onto my face with a back-jarring jolt. 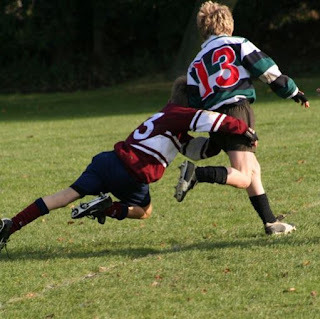 It was an impressive moment, sadly not captured on camera but this photo of a rugby tackle serves as an adequate visual metaphor for what happened. Courageously, you might think, I didn’t let go, and was soon able to stand up and tuck her between my legs and Gabrielle and I then set to shearing our very first sheep under the helpful guidance of Renée (seen holding the head of the ewe in the photos). A professional shearer can shear a sheep in less than 2 minutes and will remove the fleece in one piece; we wouldn’t have won any speed records but it did all come off in one piece and the ewe looks much smarter, with no straggly missed bits. If speed is your thing, then stare open-mouthed at the following sheep-shearing records : the world record for shearing sheep is 839 lambs in 9 hours by Rodney Sutton of New Zealand (2000) and 720 ewes in 9 hours by Darin Forde of New Zealand (1997). 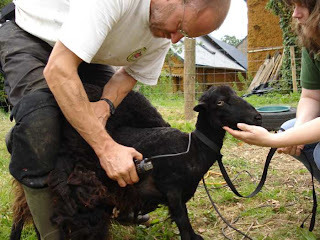 The most sheep shorn in an 8 hour period manually using hand blades is 50 by Janos Marton of Hungary (2003). So what are you going to do with your fleece? Getting some rain here finally. Not as much as we need but way more than we have been getting. Sorry about your potatoes. Ours are doing somewhat o.k for not having much rain. We will at least get some this year---though not as many pounds as we hoped for I am sure. Crazy weather last year and this. Makes a person wonder now doesn't it. 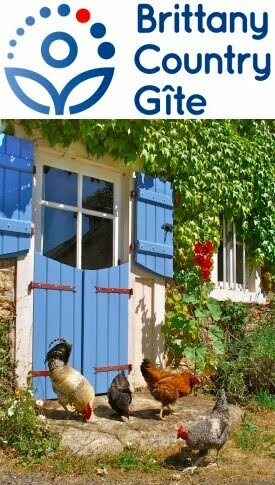 By the way---you said "at least we know it's not our permaculture methods". My neighbor that is new to gardening was happy to know her poor harvest wasn't due to her inexperience---that mine has been just as bad. Always nice to know we haven't messed up more than anyone else isn't it! Well---here's to better weather "cheers".